Many people, like myself, own wood-burning stoves and fireplaces for heating their houses. Others may not need it for heat, but enjoy the “atmosphere” of a fire. Regardless of the reason for owning a stove, owners always need the latest accessories! There are a number of items that not only are useful, but make great gifts. I know I’d be happy to receive all of these! It is imoprtant to know the temperature of your stove's fire so it can be regulated. If the temperature is too low, more wood is needed. If it’s too high, you’ll know to tamp down the flames. One of the greatest dangers of a wood burning stove is the build up of creosote, which can clog the pipes, and potentially, cause fires. Keeping an eye on the temperature can be a life saver! 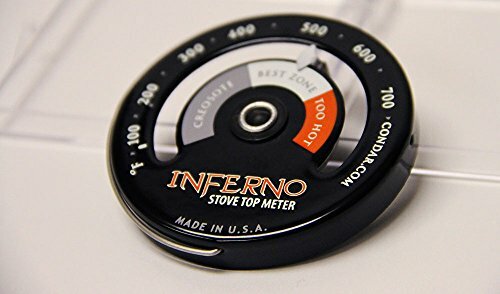 The Inferno stove top thermometer is the perfect size for your stove, and has proven to be quite accurate. It is magnetic, so no adhesives or hangers are needed. Made of porcelain with a steel case, the thermometer will hold up for a long time. The 3 zones (too cool, too hot, and just right) are color coded, so just a quick glance at it is all that is needed to gauge your temperature. Another of the things I really like about this thermometer is that it is made in the USA! An ash bucket is one of the most useful wood-burning fireplace accessories. The stove has to be cleaned continually, and carting the ashes and embers outside your home can be dangerous. This steel bucket holds up to 5 gallons of ashes, and has a tight lid to keep embers from escaping. The lid closes tightly, to keep the ashes inside, and the moisture, out. The bucket also has a wooden handle, which will keep your hands from getting too hot. The shovel is wide and flat, with a long handle that makes it easy to remove the ashes from the back corners of the stove. Firewood is a necessity when it comes to wood-burning stoves and fireplaces, and it’s best to keep it up off the ground. Why? It’s to keep the wood from rotting, plus it helps keep out bugs, rodents and snakes. 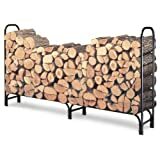 This 8 foot long fire wood rack will hold your logs up off the ground, in addition to keep them from rolling around. It has high sides, and will hold a cord of wood quite easily. Most importantly, it is made of steel, and easy to assemble, so it will hold up for many years. Need instructions on how to split and stack firewood? Read this article. While it’s possible to start a fire in your wood stove with crumpled newspaper and a match, it’s much better to use fire starters. I’ve tried several brands, and found Fatwood to be the best. Fatwood is made from the stumps of pine trees, which have a high concentration of resin. The resin is what makes the fire burn faster and longer. 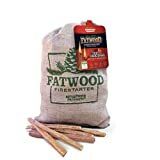 Just light a stick of Fatwood, and put it in the stove with your firewood. It is the quickest way to get your fire going. It’s made of cast iron, so it is heavy enough to withstand the heat from the stove. Plus, it has a lid (my pot didn’t have one), and it can hold up to 2 1/2 quarts of water. When the stove heats up the water, steam is released through the spout. 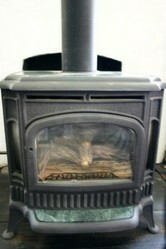 It also has the old fashioned look that matches wood-burning stoves, so it will fit in with your decor. And of course, you can always give a cord or two of firewood! Do You Have A Wood-Burning Stove or Fireplace? I’ve had my wood-burning stove for 5 years now, and it does a great job of heating my house during the winter months. Plus, it saves on the heating bills! Over these 5 years, I’ve learned a great deal on what works – and doesn’t – when it comes to accessories. But I’m always open to learning more! Do you have suggestions or recommendations for other accessories? I love he tea kettle! Makes you think of rustic farmhouses from yesteryear. Step-by-step detailed instructions with photographs on using simple items to to clean glass doors on a wood-burning stove. Simple steps to splitting firewood safely with wedges, sledge hammers and mauls.